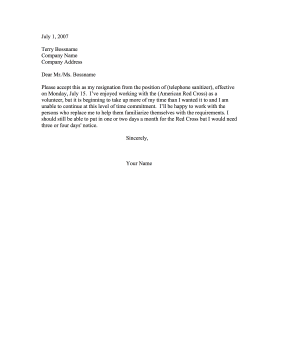 Volunteers who are strapped for time or money can use this printable resignation letter to leave a job, club, or organization. Please accept this as my resignation from the position of (telephone sanitizer), effective on Monday, July 15. I've enjoyed working with the (American Red Cross) as a volunteer, but it is beginning to take up more of my time than I wanted it to and I am unable to continue at this level of time commitment. I'll be happy to work with the persons who replace me to help them familiarize themselves with the requirements. I should still be able to put in one or two days a month for the Red Cross but I would need three or four days' notice.